The Story Collider is delighted to be partnering with the Fermilab Arts and Lecture Series for this upcoming show at Fermilab's Ramsey Auditorium! Join us for an evening of true, personal stories about physics, hosted by The Story Collider's Erin Barker and Kellie Vinal. Tickets are on sale now at the link below! Doors open at 7:30 pm. Michael Albrow lived in England until 1969, when he completed a Ph.D. in experimental particle physics at Manchester University. He then moved to Geneva, Switzerland to do experiments at CERN as a post-doctoral fellow, and then staff member. 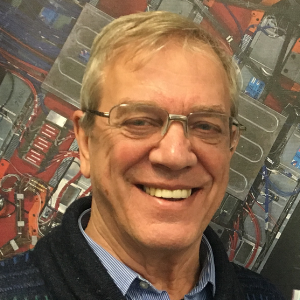 Apart from two years back in the UK at the Rutherford particle physics Laboratory, he worked at CERN, at the very first proton-proton collider, until becoming a professor at Stockholm University. Mike moved to Fermilab 26 years ago to join the CDF (Collider Detector at Fermilab) project, participating in the 1995 discovery of the top quark, the heaviest known fundamental particle. In 2005 he joined the CERN Large Hadron Collider project CMS, and had a small part in the discovery of the Higgs boson. Mike retired in 2016 to spend more time writing about physics (he has a monthly Science Corner in the paper Positively Naperville), and on other pursuits such as acting (in two weeks he will be in the musical “She Loves Me” in nearby Glen Ellyn). But as he says: “Once a physicist, always a physicist” and he is still active in CMS. Cindy Joe is an engineering physicist working with several of Fermilab’s experiments studying neutrinos, tiny particles that might hold the answers to some of the universe’s biggest mysteries. A first-generation college student, she grew up dreaming big in the back of her family’s Chinese restaurant in a small town in Arkansas. While obtaining her bachelor’s degree in physics, she also became a licensed senior reactor operator at Reed College’s nuclear research reactor. She then moved to even bigger machines, working as a particle accelerator operator in Fermilab’s Main Control Room for seven years. Cindy is deeply passionate about science outreach. A 2-time presenter at Fermilab’s Physics Slam and a contributor to PechaKucha Night Batavia, she currently lectures in Fermilab’s Saturday Morning Physics program for high school students. Don Lincoln is a Fermilab senior scientist who uses data recorded at the Large Hadron Collider to try to unlock the mysteries of the universe. His scientific accomplishments include contributions to the discovery of the top quark and the Higgs boson. In addition to coauthoring over 1,000 scientific papers, he is a prolific science writer for non-scientists, including articles for CNN, NOVA and Scientific American. He has written four books, including “The Large Hadron Collider: The Extraordinary Story of the Higgs Boson and Other Things That Will Blow your Mind.” He has produced a popular series of YouTube videos on the Fermilab channel and a 24-lecture course on The Theory of Everything for the Great Courses. He is a fellow of the American Physical Society and the American Association for the Advancement of Science. He was awarded the 2017 Gemant Prize from the American Institute of Physics for science writing. Lindsay Olson is a visual artist whose work is inspired by science. Her artistic practice grows out of an intense curiosity about the ways our society is supported by science and technology. She has worked as Fermi National Accelerator’s first artist in residence, with the CMS experiment at CERN, the Metropolitan Water Reclamation District in Chicago, the Field Museum and the Chicago Botanic Garden. She is currently working with the Army Corps of Engineers. Lindsay worked in fashion design for many years and now teaches textiles at Columbia College Chicago. Her work is touring in both Europe and the US. Her work has been featured in Scientific American, The Chicago Tribune, Symmetry and many other publications.